The past few years have seen the emergence of several defence magazines of varying quality and staying power. FORCE magazine stands out among them as a serious journal, which carries well-researched, authoritative, topical and informative articles. Every publication bears the imprint of its editor, and I think Pravin Sawhney, using his skills as a former artillery officer does tend to zero-in on the target, often risking life and limb by ‘shooting across open sights’ as far as national security issues are concerned! So having crossed the two-year mark, and with 24 issues behind you, there is good reason for hope and optimism for the future. I have no doubt that the best is yet to come. And as they would say in Star Wars’ lingo: ‘May the Force be always with us’. FORCE has indeed done a wonderful job and deserves praise for being a leader in the game of journalism based on national security. You have indeed filled the void that existed for long. FORCE has a number of interesting articles on issues concerning the defence forces of the country. I am sure FORCE will continue to provide a forum for dissemination of views on contemporary issues of national importance. I wish FORCE all success in the future. FORCE has evolved as the premier security affairs magazine in the country. It has provided invigorating articles which are well-researched and balanced. The magazine covers a variety of issues from the latest strides being made in the field of weapons and equipment to critical issues of national security and international relations. I am sure that force will continue to achieve the high standards they have set for themselves and provide readers with intellectually stimulating information and analysis of contemporary security issues. Over a period of time, FORCE magazine has emerged in the forefront of defence journalism and has consistently provided quality and thought-provoking articles on issues of national security which one can ill-afford to ignore. The critical, in-depth and informative analyses on matters defence bear a stamp of high professionalism and deep commitment. I commend the editorial team for their sustained efforts and wish them success in transforming into a ‘ FORCE to reckon with’ in the days ahead. FORCE magazine has contributed significantly by enhancing awareness of services’ related aspects and critical analysis of national security issues. To military professionals in particular, FORCE magazine provides incisive and useful insights. I am sure that FORCE magazine will continue to strive and achieve greater heights of success. 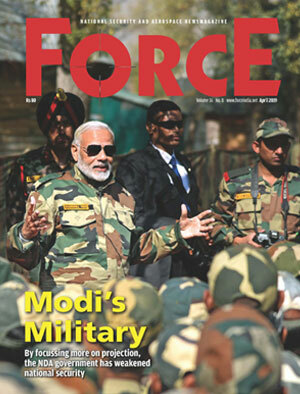 FORCE magazine, over a period of time, has taken a centre-stage in providing a descriptive and critical assessment on matters of national security at a time when the information flow is voluminous, unorganised and at times distorted. It has created a niche for itself in security-related journalism through balanced and pragmatic analysis. I am confident that the editorial team, with sustained efforts, would bring FORCE magazine to greater heights of success. FORCE has decidedly established itself amongst the leading magazines on security issues in the country. Its approach is professional and its perspectives analytical, refreshing and balanced. Its content encompasses all aspects of national and international security and not merely limited to news and description of inventories. I find it topical, insightful and useful. My compliments to the FORCE team on what they have achieved and wish them all success in future. FORCE magazine has gradually emerged as a compendium of matters and developments concerning the national/international security issues. The articles are replete with emerging trends and perhaps today it is one of the few magazines dedicated to security-related feature writings. Another significant profile of the magazine is the contribution of articles by a wide range of security experts. I am sure that FORCE magazine will reach greater heights and success in its endeavour. FORCE is one of the premier security affairs magazines, which covers a wide spectrum of national and international security issues. The articles by the distinguished panelists are balanced, eloquent, and of a high professional order. It provides interesting reading and useful information to defence personnel. I would like to compliment the FORCE team for their achievements and wish them greater success in future.